So, you’re looking for the best RV Extended Warranty? 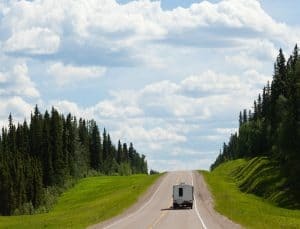 In Part I of this three part series, we discussed the basic terms you need to know when reading your RV extended service contract. In Part II, we’ll dive deeper into discerning fair part and labor prices along with what you can expect to pay without motorhome or towable RV warranty coverage. Miss Part I? Start here! An inspection on your vehicle is especially valuable, particularly when it comes to used coaches. This third party, unbiased service, can indicate any pre-existing conditions that need to be addressed by the dealer or private seller before purchasing your home-on-wheels. Additionally, when a vehicle reaches the end of its factory warranty, a full mechanical inspection is required before a motorhome extended service contract can be issued for the unit. Any delays in completion of the inspection can result in delays in coverage and therefore an increased policy price. A mechanical inspection negates the ability for administrators to indicate a pre-existing condition on the repair later on. Not only does this process streamline future claims, but it encourages safe travel in addition to peace-of-mind. The simple fact is that RVs will breakdown, inspection or not. The question is whether you are ready to incur the repair costs of it all. Common motorhome failures include: electrical, air conditioning, slide outs, leveling jacks, refrigerators, power steps, awning systems, inverters, and generators. Three out of every ten rigs will have a major breakdown by their second year on the road, which is typically outside of any factory warranty. With such a high chance of RV failures, the best way to protect your travel budget is with coverage by a manufacturer or extended service contract. Once your RV is outside of manufacturer coverage, you’re at even higher risk, as RV repair costs spike with vehicle age. 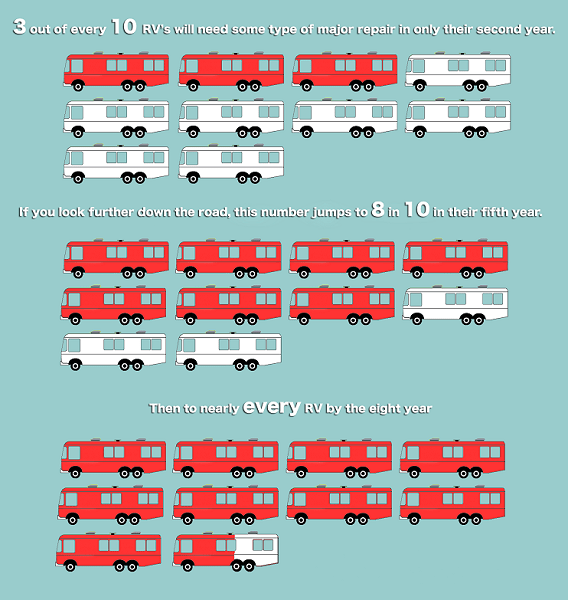 In fact, our claims data shows that eight out of ten RVs will need major repairs by their fifth year, and nearly every RV by their eighth year on the road. It’s no secret that repairing your rig can be costly. Expected cost of labor can be estimated at $100 per hour, while parts typically run at double the labor cost at $200 per hour. Combined, these total about $300 per hour on any average repair. These costs add up quick, and the most common repairs your home-on-wheels might need can run you $3,500 and higher! (According to our most recent claims data). 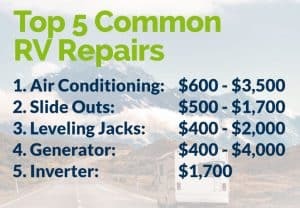 RV extended warranties can combat this rising cost of repairs by stepping in to pay for mechanical and electrical fixes your rig might need. Keep in mind that each visit to the repair facility will have its own deductible. Depending on the policy you choose, this can be as low as $100 per claim. It’s important to keep in mind that we do have an extended service contract which has saved us $1,848.53 so far. Without that, our expenses would have totaled $4,748.43 over the 2 years, an average of $2,374.21 per year ($198/month). We definitely appreciate the extra peace of mind this coverage brings us, knowing that the cost of most major repairs is capped at our deductible. 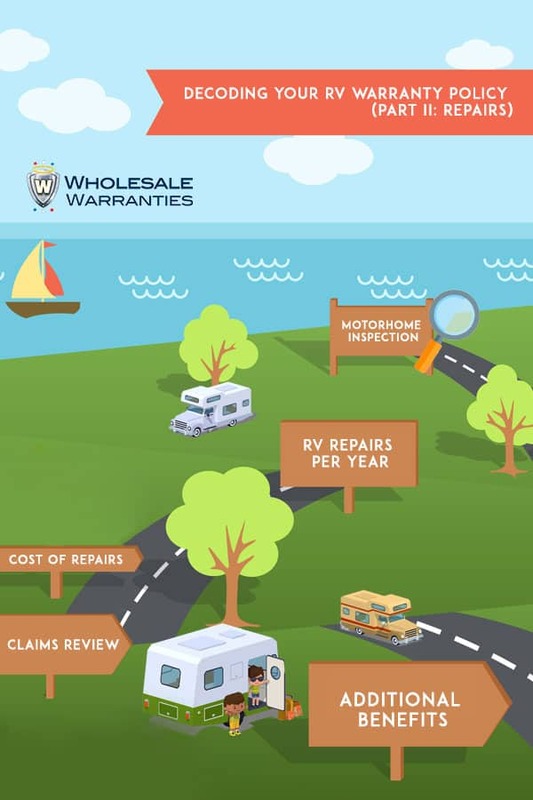 Not all RV warranty companies are created equal, and the policy in itself does not guarantee the company will go up to bat for you when you need it most. Does the extended service contract you’re considering come with an extra layer of support? The best compliment to a solid contract is unparalleled customer service and highly trained claims adjusters who are familiar with the RV industry. This layer of customer support can serve as a buffer between the customer, mechanic or repair facility, and warranty company. If your claims support specialist sees that any requests are outside the standard, they will work directly with your mechanic to find resolution for your repair. This feature allows for full confidence in the work being performed on your coach giving you more time on the road doing what you love, instead of spending time worrying about costly repairs that will cut your travels short. RV breakdowns are frustrating, and having your rig at the shop can force your vacation to a halt, and interrupt your best-laid plans. Not only can these be inconvenient, but they can be downright expensive. Some extended service contracts will have additional perks, including trip interruption benefits, that will reimburse you for expenses like meal and lodging or roadside assistance. Even if your rig still has time on its manufacturers warranty, purchasing additional extended warranty coverage will allow for these ancillary benefits while your home-on-wheels is in the shop. As the mechanics of motorhomes become increasingly more complicated, so do the chances of a breakdown and the need for warranty coverage. Make sure the warranty company you choose will be at your side to answer your calls, questions, and more importantly…assist you with claims long after you’ve purchased the policy. For a personalized RV extended service contract quote, fill out this free, no-strings-attached quote form, and see if Wholesale Warranties has the right policy for you. Somewhat disappointed in Wholesale Warranty. I purchased a policy from Stephen Metz back in 2017 for my new Entegra. Since then, I recommended 2 different people who purchased from Wholesale Warranty and I never so much as received a “Thank You” for the recommendation. I know at least one did tell Wholesale Warranty that I had recommended the company. In fact he called me after the purchased and asked if I had heard from Wholesale. So sorry to hear you didn’t receive your gift card for referring customers our way. We truly appreciate your recommendations, and would love to get those cards out to you now. Please feel free to reach out to us by phone at 800-939-2806 or e-mail to [email protected] with the names of your referrals, and we’ll get this taken care of for you ASAP! Thank you again for your referrals, and Happy Travels!